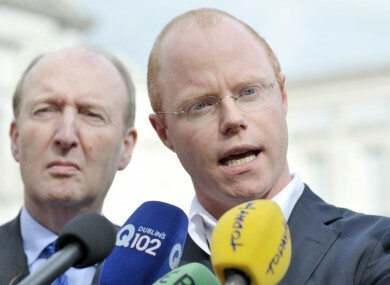 Independent TDs Stephen Donnelly (R) along with Catherine Murphy (not pictured) are leading the project. A GROUP OF Independent TDs, technology and legal experts are seeking to crowdsource their submission to the Copyright Review Committee that is examining current copyright legislation in Ireland. The crowdsource project is being undertaken by the independent TDs Stephen Donnelly and Catherine Murphy along with Antoin O Lachtnain of Digital Rights Ireland, Tom Murphy of Boards.ie and solicitor Simon McGarr. Under the project, a draft submission to the committee, chaired by Eoin O’Dell from Trinity College Dublin’s School of Law, has been posted on the website copyrightreform.ie with the application Digress.it which allows people to comment on individual sections of the submission. “Our objective in making a submission is simple: we’re seeking to bring about a balance of rights in our copyright regime that recognises the legitimate interests of all parties – including the fundamental rights of the consumer,” Murphy said. Users are also able to take parts of the submission they agree with and use them as a basis for their own submission to the committee which was set up in the wake of controversy over a controversial statutory instrument signed into law earlier this year. The SI reinforced some of Ireland’s existing copyright laws built was the subject of significant debate in the digital sector amid fears that it could limit internet freedom. The Minister of State for Research and Innovation, Seán Sherlock, had also faced criticism over a lack of consultation and said he was establishing the Copyright Review Committee to remove “barriers to innovation”. “As there are clearly many diverse interests, it is important that interested parties come together and work in a constructive way to map the path forward,” he said earlier this year. The submission on copyrightreform.i makes a number of recommendations including that any review take the needs of consumers and citizens as “a key consideration”. It says that the system of copyright must facilitate “fair payment” to creators, that reform must allow for the “accelerating pace of technological change” that it should “positively differentiate Ireland from other jurisdictions”. It also adds that the review must take into consideration the decisions of the the European Court of Justice that balance “the right to copyright enforcement with civic and human rights”. “The aim of this submission is to rebalance the copyright regime so that it recognises the rights of the consumer alongside those of the creative producer,” a statement from Donnelly said. “Copyright protection must encourage innovation and investment and must support Ireland’s reputation as a creative hub and home to start-up internet enterprises as well as to major tech companies. Email “TDs, tech and legal experts seek to crowdsource copyright review submission”. Feedback on “TDs, tech and legal experts seek to crowdsource copyright review submission”.